Oddly enough, I find myself writing the first draft of this review of the Manly Patriot on the morning of the 4th of July. Fitting to write a about a knife called the Patriot on a day set aside for patriots. But then again, I’m not sure how patriotic it is for me to write about a knife made in Bulgeria on Independence Day. I should probably be reviewing this Patriotic Eagle Head and USA Flag Folding Knife instead. Back to the Patriot. I reviewed it’s folding cousin, the Manly Peak, a few months ago, and enjoyed its clean, utilitarian design. The Patriot is even simpler. Not surprising given it was designed to be the fixed blade version of the Peak. I’ve had my heads in the clouds recently reviewing high end folders, so it’s almost odd to hold something this simple and spare. But let’s face it, these kinds of designs are the most practical, and most likely to see some use. Accordingly, my Patriot has seen a good deal of action. It’s one of those blissfully simple knives you can’t help but use. I’m ready to write about it. This knife was provided by the manufacturer for review and long term testing. All thoughts are my own. The Manly Patriot has an overall length of 8.66″ (220mm), a 3.70″ (94mm) blade, and weighs 4.4oz (126g) ounces. Manly is a Bulgarian knife company, and that’s where the Patriot was both designed and manufactured. I think the knife is a great size for general utility purposes. It wouldn’t be out of place if you lived on a rural property, and could accompany you on a hunting or fishing trip. Certainly it would work well on a camp site, and it’s perfectly fine for tooling around in the back yard. It has a good heft to it, so it’s not ideal for ultra lightweight backpacking, but it’s fine for day hikes. It’s too large to be an urban EDC fixed blade. It was designed to be an all-purpose utility knife and I think it’s dimensions are appropriate with that in mind. The blade is an ultra simple drop point with a full flat grind. There is no swedge. The tip is fine without being delicate. The edge has been evenly applied and there is a small sharpening choil. The entire knife has been given a something of a satin finish. All of this is simple but nicely executed. Perhaps the most remarkable feature of the blade is how it has been ground from 4mm thick stock. It’s relatively thick stock for a small knife like this. Still, the Patriot is ground thin behind the edge and is a capable slicer. I’ve used this knife quite a bit for cutting apples. It cuts beautifully in that capacity, and the simple fixed blade design makes the knife much easier to clean than a folder. Just like the Peak series of folders, Manly offers the Patriot in a variety of blade steels, including S90V, 154CM and DIN 1.2379. My particular knives came in DIN 1.2379. DIN 1.2379 is a German steel and is equivalent to ANSI D2. Here is a link to the full data sheet for 1.2379 where you can review the chemical composition. Here is a link to DIN 1.2379 on the excellent ZKnives Steel Composition Chart. With a Chromium content of 12%, 1.2379 is more stainless than other variants of D2. My experience with the Patriot in DIN 1.2379 has proven it to be a capable cutter multiple times. The toothy steel and full flat grind means the knife cuts aggressively. It’s a wonderful knife for breaking down large cardboard boxes, and tackling other large utility oriented chores. I’ve found the knife to be a capable carver, easily peeling off large strips of wood from some ficus logs I have in my back yard. It isn’t great for batoning, as it’s a relatively short blade, and a full flat grind, but you can baton little sticks and stuff with it. I haven’t had any issues with rust or corrosion. I wouldn’t have guessed this steel came in a D2 analog. It’s nothing like the D2 on my old Benchmade 710. This DIN 1.2379 is easier to maintain and seems to be more stainless. The Patriot features contoured G10 handle scales permanently fastened to the handle with epoxy and eyelet rivets. Fit and finish is excellent. The parts all line up and are flush. The edges of the handle scales have been sanded down for comfort and rounded to provide some palm swell. The eyelet rivets are simple yet effective. The eye holes themselves are large and you can easily thread a couple strands of paracord through them. Perfect if you want to attach a lanyard or lash the knife to a stick for some reason. Rounding things out is a small amount of exposed tang at the pommel. This could be used as an impact tool. The ergonomics of the Patriot are excellent. As I mentioned earlier, there are no sharp edges on the handle and the handle design itself is simple. The combination of contoured handle scales and thick blade stock fill your hand nicely. There is sharp jimping on the thumb ramp, and the secondary finger ramp right before the sharpening choil. This provides excellent grip, even in slippery situations. The G10 itself has a very light texture to it. Most of the grip comes from the jimping. In practice I found this to be a comfortable handle. The knife has a natural feel in both forward and reverse grips. The balance point is about an inch behind the forward eyelet rivet, giving the knife a neutral feel if you choke back. Snugged up on the handle it has a slightly forward feel to it. The jimping strikes that nice balance of being present but not obnoxious. You can cut for an extended period of time without your thumb wanting to fall off. All said this is a comfortable knife that will be easy to use in a wide variety of circumstances. The Patriot comes with a molded kydex sheath. The sheath has been finished in the same simple yet thoughtful manner that the knife has, and it serves as a good counterpoint to the knife. There is a large eyelet rivet so you can tie a lanyard to the sheath, or you can attach the included belt loop to any one of the 7 small eyelet rivets and thread a belt or strap through the loop and carry it that way. The fit and finish on the sheath is excellent. It has been crisply cut, and it’s sturdy. There is a drainage hole near the tip. Retention is great. The knife slides in with a solid “snap” and the knife is held firmly in place. There is no rattle or shake of any kind. This is the kind of sheath I would like to see with pretty much every production fixed blade knife. It’s a simple kydex sheath with good knife retention and plenty of mounting options. What else could you ask for? I’m not as impressed with the belt loop. It’s the kind where you need to take your belt off to pass your belt through the loop, vs. a quick release system. It’s basic and it works, and I suppose if you wanted something fancier you could always mount a tek-lock to the sheath. But it’s not something I see myself using. I prefer to instead pass a length of paracord through the large eyelet rivet and tie that to my belt and then carry the knife in my waistband or pocket. I recently repurchased the Nimravus and have an updated review coming soon. It’s a bigger knife, and seems far more complicated than the Patriot. I’m a fan of the Patriot. It’s everything you need from a small fixed blade knife and nothing you don’t. At around $75.00 I think it is priced appropriately. You get a thoughtful design that has been nicely executed with high quality materials. The blade cuts well, the handle is comfortable, and the sheath is excellent. DIN 1.2379 is something of an unknown quantity here in the States, but I have found it holds a good edge, is easy to maintain, and I haven’t had any issues with rust or corrosion. I have found myself reaching for the Patriot again and again. It’s great for dirty jobs whether they are big or small. While a simple knife like this won’t attract the attention of a high end production folder, it’s perfect for people that want a simple no-nonsense fixed blade for general use. Recommended. That said, please consider that buying anything through any of the links on this website, including Amazon and BladeHQ, helps support BladeReviews.com, and keeps the site going. Any and all support is greatly appreciated. Thank you very much! Hinderer Knives is a company best known for their overbuilt XM Series. Burly titanium framelock flippers that helped popularize the titanium framelock flipper. So to see them release the XM-18 Slippy, a slip joint using their XM pattern, is a bit of an oddity. But then again, it’s not that surprising given the recent resurgence of interest in slip joint knives. And oddly enough this may be their most practical daily carry folder yet. Reasonably small, slim, lightweight, and retailing for under $300, this may be the Hinderer that you didn’t realize you needed. The XM Slippy has an overall length of 7″, a 3″ blade, weighs 3.71 ounces, and is made in the USA. It’s a great size for urban or suburban daily carry. It has similar dimension to the XM-18 3″, but is a hair thinner, .4 ounces heavier, and $150 cheaper. I think if they had to borrow from one of the XM framelocks, the 3″ version was smart. This is all I need for an EDC knife. The 3.5″ version would have been way too much. Hinderer has rolled this knife out in a couple of blade shapes, but shown here we have their classic drop point. It’s hard to go wrong with the clean look and practical features of a drop point. A good functional tip, plenty of belly, and Hinderer’s high flat “slicer” grind all work together to provide all-round performance. Most of these early XM-18 Slippys appear to be coming with CPM-20CV blade steel. We are starting to see more high end knives in CPM-20CV. I’ve reviewed a couple Benchmade knives in this steel, including the G-10 Griptilian. Another notable knife in CPM-20CV is the Cold Steel 4MAX. So at this point I have a few knives in my long term collection in CPM-20CV and I’ve put some miles on them. CPM-20CV is Crucible’s answer to Boeller M390. It’s the same chemical composition as M390, but it’s made by Crucible in the USA. I think it’s a great steel, and it provides a good blend of edge retention, ease of sharpness, corrosion resistance and toughness. 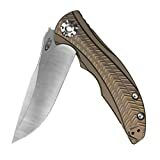 Here is a link to ZKnives’ page on 20CV where you can get some more details. In practice this is a slicey knife that has performed admirably in all the typical EDC chores. I have used my Slippy for your basic EDC knife stuff including opening mail, breaking down boxes, light food prep, and the random jobs that you invariably encounter when carrying a pocket knife. For each task the Slippy worked fine. It slices well and the stonewashed finish hasn’t shown much in the way of wear. Edge retention has been great, and when it’s time to touch it up, all I’ve needed to do is run the edge along the fine stones that came with my Spyderco Sharpmaker. I can’t ask for much more out of a daily carry blade. The handle is textured G10 scales over titanium liners secured with Hinderer’s custom hardware. One complaint is they have a lot of extra bolts on this thing. The show side has the pivot, 2 bolts by the lanyard hole, and then 3 button head bolts running across the handle. These may be necessary for their slip joint mechanism, but it’s not pretty. It would look much cleaner if they could ditch the button heads. Beyond that, everything has been executed with Hinderer’s typical care and attention to detail. All the pieces have been beautifully finished, the parts line up, and any sharp edges have been broken. Anyone who has handled a regular XM will know what I’m talking about. The fit and finish is top notch. This is a comfy little knife. The 3″ XM pattern is tried and true, and it’s just the same for this slip joint version. You have a good size handle with plenty of room for a full 4 finger grip. If you want to choke up on the blade you can with the forward choil. There is a run of mild jimping on the spine of the handle right above the pivot, and the textured G-10 scales offer grip without shredding your pocket like a fresh emery board. The pocket clip is your standard XM-18 spoon style clip positionable for right side tip up or tip down carry. This is a proven clip that does a good job of keeping the knife mostly buried in the pocket. Hinderer includes a filler plate so you fill the void in the G-10 when you reposition the clip. There isn’t much to complain about when it comes to this pocket clip. Some may favor a deep carry clip, but very little of the handle peeks up out of your pocket anyway. In practice the Slippy carried like a dream. Thin, lightweight, and discreet. For the most part, all the stuff above is essentially a review of the 3″ XM-18 in CPM-20CV steel. Nothing earth shattering in my findings. This section is where it gets interesting. Our titanium framelock has been replaced with a slip joint, and our flipper and thumb studs have been replaced with an adjustable thumb disk. The thumb disk is removable with an allen wrench, so this knife can be made into a 2 hand opener. Good for certain legal jurisdictions. Personally, I left the thumb disk on, but I did adjust it by loosening it with an allen bit from my WiHa bit set, and then sliding the thumb disk down the channel cut into the blade. I positioned it to a good “sweet spot” where my thumb naturally brushes it when gripping the knife. In practice I think this is a cool feature. The groove in the blade may look a little weird at first, but I quickly got over it, and I like how the thumb disk can be adjusted to fit your hand. Lets talk about the walk and talk, since this is a slip joint after all. The backspring on this knife is pretty good. I’d give it a “6” on a 1-10 scale, with 1 being floppy, and a 10 requiring significant force. I’d put most Swiss Army Knives around a 3 or 4. The Slippy has a good amount of resistance, but it won’t rip your fingernails off as you try to open the blade. The blade opens up with a satisfying snap, and that same strong spring holds the blade open. There isn’t a hard half stop, but there is a “no man’s land” at the 90 degree point. From there you can push the blade closed and the spring takes up the slack to bring the blade home. I liked this XM-18 Slippy more than I expected to. What I appreciate is the simplicity. The Slippy has everything you need, and nothing you don’t. I know everyone’s needs are different, but for me 99% of the time I don’t need a locking folder for my daily carry chores. So this slip joint version strikes me as streamlined and practical given what I require out of an EDC knife. For those wanting a more robust locking folder, there is always their regular XM-18 series. In addition to the practicality of the XM-18 Slippy, I’m also drawn to the price. A sub $300 Hinderer is an accomplishment in my book. The Slippy is a full $150 cheaper than their framelock version. It’s still expensive, but this is a relatively small batch precision product made in the USA. It oozes the kind of quality you would expect from Hinderer. My example is flawless, and at this price I’m a little more inclined to roll the Slippy in my daily rotation carry than keep it as a collectible. As for potential downsides, I’m not a fan of the extra screws featured on the show side. I haven’t taken this knife apart to see why the bolts are necessary, but probably should. If I do I’ll snap a picture and update the review. Also, some may not be able to get around the thumb disk and channel in the blade. It’s unusual and strikes me as an acquired taste, but I don’t mind it. Like the rest of the knife, it’s practical and it works. In closing I think Hinderer did a nice job with their take on the slip joint. The slip joint bandwagon has been gaining a lot of steam lately, but Rick and his team have found away to offer a unique take on the slip joint that compliments their existing lineup. Recommended if you are looking for a premium non-locking EDC, are curious about the design, or are a fan of Hinderer knives in general. I recommend purchasing the Hinderer Knives XM-18 Slippy at BladeHQ, Amazon, or Knife Art. Please consider that purchasing anything through any of the links on this website helps support BladeReviews.com, and keeps the site going. As always, any and all support is greatly appreciated. Thank you very much.